Designed for mobility with an elevated laptop holder and monitor arm. This frees valuable desk space and keeps technology within reach. The set includes a TSS column, a TSS folding arm III, and a TSS notebook holder. The TSS column is 17.52″ tall and securely attaches to a desk surface between .55″ and 1.57″. The TSS folding arm III is a two-part, adjustable monitor arm with a range of 19.88″. 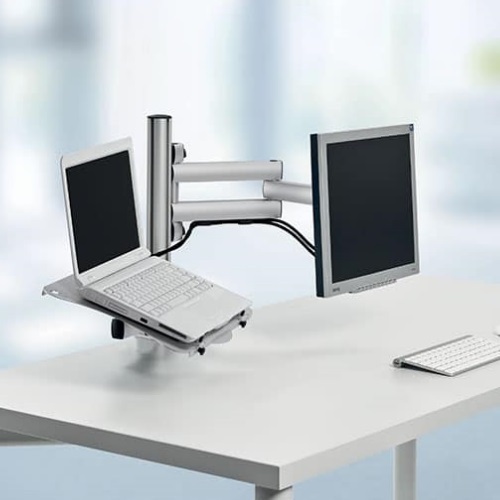 Constructed of high quality aluminum and metal, the Folding arm III can hold 1 monitor weighing up to 15 lbs and is equipped with a Quick Release monitor mount – simply click the monitor in place and tilt to the perfect viewing angle. The notebook holder has a range of 23.19″, holds a laptop up to 15″, and can be be tilted up to 45 degrees. The NOVUS Business Combination is covered by a 5 year manufacturers' guarantee.